← 14 February 1862: It seems that on Monday the enemy got possession of Elizabeth City. Henningsen was there & retreated – When last heard from he was at Newby’s Bridge & probably escaped to Suffolk or some point on the Rail Road to Norfolk. 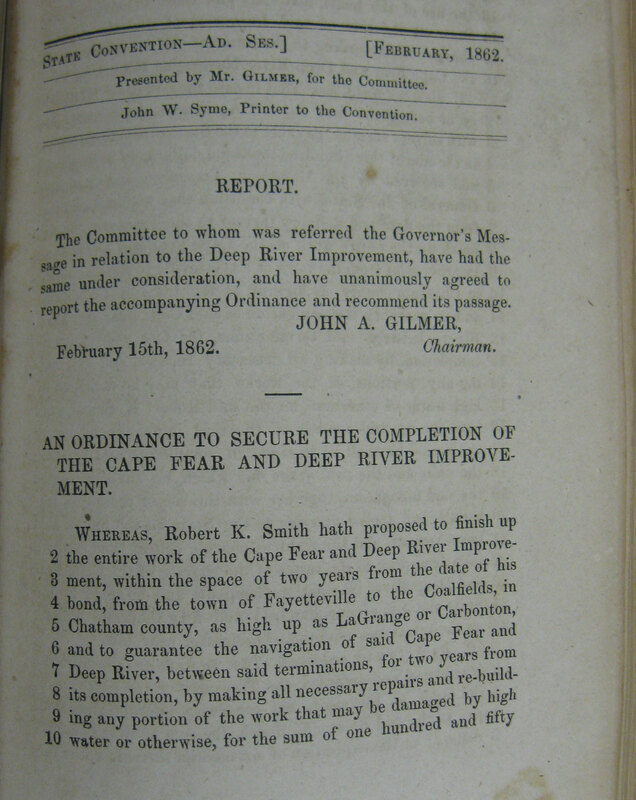 Item description: In this report, a North Carolina Secession Convention committee recommends an ordinance calling for navigational improvements on the Cape Fear and Deep Rivers. The work would be overseen by Robert K. Smith, and, if completed, would provide better access to coal needed for the Confederate cause. 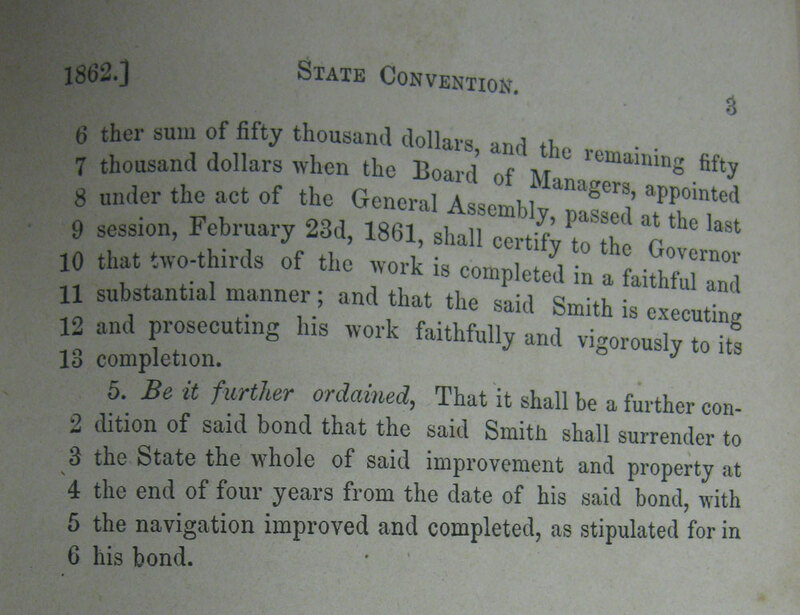 Item citation: “Report.” Documents of the Convention of 1861. Vol. 1, No. 57. [Raleigh, N.C.] : John W. Syme, . VC342.2 1861d V. 1, from the North Carolina Collection, Wilson Library, UNC Chapel Hill. 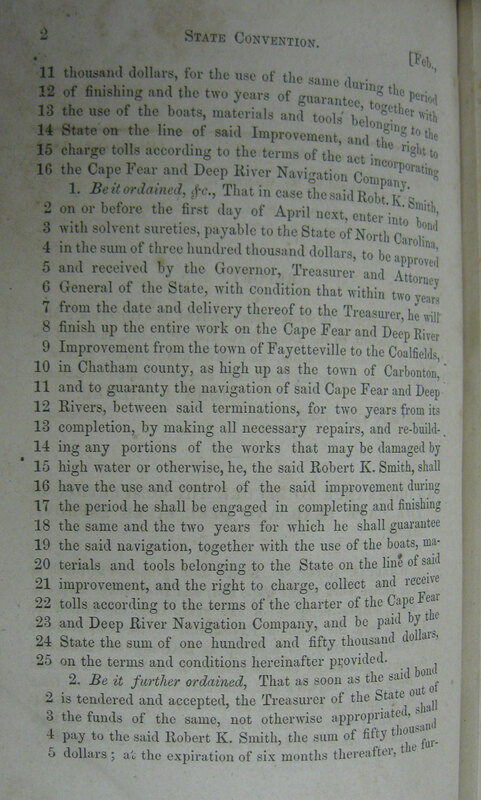 This entry was posted in North Carolina Collection and tagged Cape Fear River, coal, Coalfields, Deep River, internal improvements, North Carolina, ordinances, Robert K. Smith, Secession Convention. Bookmark the permalink.